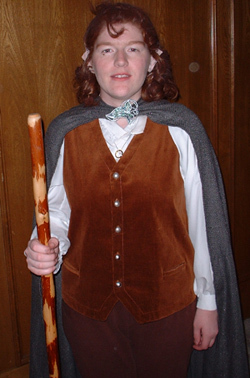 This article contains information on the Frodo costume I put together when I had a Two Towers viewing party. At the time I put the costume together I had never sewn. But with some determination and the help of good friends, I was able to come up with an awesome costume that looked great and was enjoyable to wear. So, if you are looking for some ideas and tips on how to become a true Hobbit, read on! The very first thing I did to put together my costume was go to a good thrift store. By good I mean a thrift store where clothes are overflowing off the shelves. 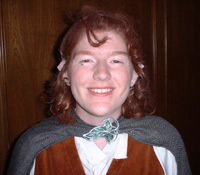 My intention in putting together this costume was that it be close enough to Frodo for people to know who I was. I wasn’t trying to be totally accurate, so hitting the thrift stores saved me both time and money (and I ended up looking just like Frodo, anyway)! I found both the shirt and the pants at a thrift store. The shirt is a woman’s shirt with gathered sleeves at the shoulders. Frodo wears a gathered sleeve in the movie. You cannot find a man’s shirt with gathered sleeves, so you have to buy a woman’s. The original collar of the shirt was attached to scarves. We cut those off and then rolled and tacked back the remaining collar fabric to make Frodo’s round collar. The pants are a red-brown color and made of a stretchy material, so they were easy to roll up so the length was right. Some people may not like the way rolled up pants look, so it is just as easy to cut cheap thrift store pants at mid-calf. That would give them a more loose fit. The vest was my most expensive buy. I looked around for one at the thrift store, but couldn’t find a vest that matched the one Frodo wears for the majority of the movie. I finally decided that it would have to be made. Thanks to the awesome website Alley Cat Scratch (Alley Cat Scratch – LoTR), I found a pattern that would work. I used the pattern Butterick 3721, view B. It’s an historical man’s vest pattern. There were only a few modifications that had to be made. The bottom of the vest needed to be split and not straight. The pockets did not need a seam visible on the outside. The WHOLE VEST had to be made with my material. The original pattern uses fabric for the front and lining for the back. I had to make sure to purchase enough fabric for the front and the back. I bought a rust velveteen fabric. Then I found a friend who was an awesome seamstress and she put it together for me. It turned out great! The pattern I used for my cloak came right off the web. Once again I turned to the Alley Cat Scratch website. Since there is no commercial pattern that works, some people there figured one out and put it on the web (Alley Cat Scratch – Fellowship Cloak Pattern). It’s a wonderful pattern and it worked perfectly. The directions are easy to follow and I am so grateful to those who put the time into making a pattern for others to use! The first thing I did to make the cloak was find my fabric. The cloaks are a grey color, even though some green tint was added for the movie. The cloaks for the movie are made of wool with a wavy pattern and are also able to be seen through when the fabric is in front of a light source. I went to a good fabric store and found an awesome grey fabric that came awfully close to that in the movie. The fabric I used was a wool blend and although its pattern was cross weave instead of wavy, I thought it looked wonderful! After we had the mock up together with staples, we decided that the cloak pattern would fit me just the way it was. Since we had cut the pieces out of a sheet first, we automatically had the pattern pieces for my expensive fabric. We laid my fabric on the floor and cut the pattern pieces out. The rest was the old, old story of pinning, sewing and hemming (not to mention when my sewing machine stopped working and after goofing with it for a long time discovering I was turning the wheel the wrong way and then finding out that the machine wouldn’t work anyway and having to run over to my friend’s house to grab hers and finally start sewing again)! I was going to try making the Fellowship pin for my cloak by myself, but my friend volunteered to make it for me out of Sculpey clay. She’s such an artist! She sculpted it and then painted it with metallic acrylic paints. After getting the attire together, I next had to make myself look more Hobbit like. For this, I had to depend a lot on good friends who know more than I do! One of my friends is really awesome with hair. My real hair is shoulder length, has no bangs and is red. I asked my friend if she could try and curl my hair and give me bangs. We had a practice session and it looked awesome! She pulled up some of the front strands of my hair to make the bangs and then used rollers and a curling iron to give me tons of curls. After that it was all the use of bobby pins to pull my hair back and move it where we wanted it. I recommend that your hair be a bit damp when you curl it; it will hold better that way. I also had to put tons of hairspray on. After curling my hair, we then had to change its color. (No, I didn’t dye it!) I went to a beauty supply store and bought a hair coloring spray called Streaks ‘N Tips. It is a bit like spray paint. It doesn’t harm your hair at all and it washes right out. I used the color Burnt Brown. What was nice about doing my hair this way was that it felt comfortable (no wig!) and it looked natural. I next had to go to another friend for the ears. I have seen on many sites that people suggest using the plastic ears you can buy, but that is expensive and it doesn’t look real. This next friend is an artist extraordinaire! 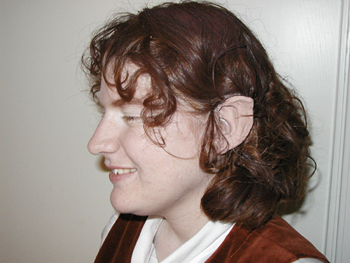 She used a natural clay (natural, earthy clay will stick to your skin) and formed Hobbit ears from a picture, then stuck the addition onto my ears with only water. The clay adheres quickly. Then she mixed some acrylic paint together to match my skin tone and painted the clay and my ear. Thus, you get a natural extension of your ears that looks real and not store bought. My Hobbit feet were the easiest part of the costume. If you want big feet, you’ll have to buy some unless you have naturally large feet! I just used my own regular sized feet, with a little adornment. I bought some theatrical hair, spirit gum and spirit gum remover at a local costume shop. (The spirit gum remover is important, because if you ever want normal feet again it is the only thing that will take all that sticky gum off!) I cut the theatrical hair into small bits and spread it onto my feet after putting spirit gum on them. To make dirty looking toes I used a dark brown eyebrow pencil around my nails. Props came next. I made a pipe out of terra cotta colored Sculpey clay. Sculpey is a polymer clay that is easy to mold and is oven baked. I rolled the stem and to form the bowl, I used a banana! I have no art aptitude, so I formed the bowl around the end of a banana and then went from there. It isn’t the most accurate pipe, but it looked good if you didn’t look too close! All I did for the Ring was use a silver necklace chain and put a Ring on it I had taken off a Lord of the Rings bookmark. Easy and cheap! Well, I hope this may have been some help to those who are looking to be more like Hobbits on the outside and reflect their inside. I wish you all the best in becoming more and more Hobbit-like! Long live the Shirefolk!